Soad Al Kuwari was born in Doha and graduated from Qatar University. 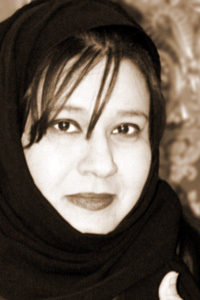 She has published five poetry collections: Malikat al–Jibal (2004), Wareethat al–Sahraa (2001), Bahtan ani al–Omr (2001), Bab Jadeed li–Dukhoul (2001), and Lam Takun Rouhi (2000). Her work has appeared in many Arabic newspapers and several anthologies, including Language for a New Century: Contemporary Poetry from the Middle East, Asia, and Beyond (Norton, 2008). She has participated in events such as the Doha Cultural Festival and the al–Begrawiya Festival, Sudan, as well as poetry festivals in the United Arab Emirates, France, Yemen, Switzerland, and Colombia.